Sugar Bakery + Cafe Coming Soon! If you're at all like Cakespy, the prospect of a new bakery opening in the neighborhood you work in is a very exciting prospect indeed. Even more exciting when it's being opened by the lovely Stephanie Crocker, who Seattleites may recognize by the wonderful tarts and brioche she has sold at the West Seattle Farmers' Market in the past, or her shortbread cookies which are available at nicer grocery stores in the area. 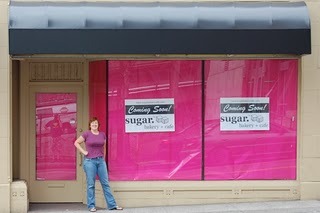 Sugar Bakery + Cafe is currently slated to open during the first week in October in the First Hill neighborhood of Seattle--keep abreast of Stephanie's progress on her blog.